(Newser) – If it's been tough to gauge how much risk is posed by Japan's damaged nuclear plants, it's because officials have given what the New York Times describes as "confusing accounts" of exactly what's going on. Safety officials say the explosion at the Fukushima Dai-ichi plant destroyed walls of the building where the reactor is located, but not the metal housing enclosing the reactor, notes AP. The blast released radioactive material, but officials say the amounts are so small the public isn't endangered. Nevertheless, they widened the evacuation zone, warned people to stay inside, and prepared to distribute iodine tablets. Reuters rounds up assessments of experts, but the bottom line seems to be that more information is needed. "We don't know enough about what the status of the fuel is in the reactor core," says one. "The issue is whether the core is uncovered, whether the fuel is breaking up or being damaged, or whether the fuel is melting." The Washington Post talks to one doctor who arrived from Germany to provide relief, but is curtailing plans to go too far north. "I'd rather be working with a pocket knife in Haiti than worrying about the danger of a radioactive cloud." "Officials downplay danger." Yeah. Even though they can't get close to it (and wouldn't if they could) but you'll all be fine if you take these iodine tablets. Capitalism fucks everything it touches. oh please. it's all about hooey sensationalism. 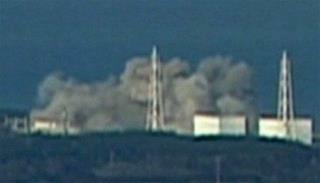 the ambassador to japan said everything is under control and there is essentially no problem with a total meltdown. iodine tabs are a feel good solution. it's nature. one that man cannot control. unfortunate yes. preventable, no. so deal with it. where is my empathy? swept under by the tsunami.